Much of the interest so far has centered on Dolezal’s potentially falsified application for a police ombudsman position and her involvement in the NAACP, which for now is standing by her. Much less ink has been spilled over Dolezal’s position as a university instructor and the issues her self-identification poses for her profession, her discipline and her students. But the case has nonetheless captivated academics, who in interviews condemned what they called Dolezal’s ethical transgressions while pointing to larger cultural forces at work. Leslie Bow, a professor of English and Asian-American studies at the University of Wisconsin at Madison who has written about transracialism, said Dolezal didn’t seem to be transracial -- a concept she said has been most commonly invoked in terms of adoption, such as when white parents adopt children of color -- as some have claimed. (Bow also has argued that transracialism indicates a kind of "social betweenness," such as Asians being treated as black or white under segregation.) Rather, Dolezal was “passing” as black, she said. And while the issue is highly complex, Dolezal's actions amounted to “misrepresentation, particularly to her students." Dolezal’s narrative -- apparently that she is part black, white and Native American -- began to unravel following local police and journalism investigations into several hate crimes she reported against her. Soon, Dolezal’s parents -- from whom she is reportedly estranged, and whom she has accused of physical abuse -- were giving national media interviews , saying their daughter was in fact white. As proof, they produced a birth certificate and photographs of their daughter with straight, blond hair. That conflicted with Dolezal’s previous claims that her father was black. When confronted by a TV news reporter on Thursday, who asked if her father was the black man she’d posted a photo of on Facebook, she said yes. 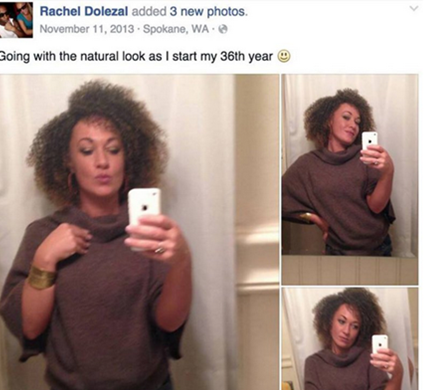 Elsewhere, including on social media, Dolezal has presented herself as black. Dolezal’s response to the question of whether or not she was African-American bothered Aaron Bady, a postdoctoral fellow in English and specialist in African literature at the University of Texas at Austin. In a public statement  issued to a local TV news station Friday, Eastern Washington University distanced itself from Dolezal, saying she’s been hired since 2010 on a “quarter by quarter basis as an instructor in the Africana education program. This is a part-time position to address program needs. Dolezal is not a professor. The university does not feel it is appropriate to comment on issues involving her personal life. The university does not publicly discuss personnel issues." The university did not immediately respond to Inside Higher Ed’s request for comment, but Scott Finnie, professor and director of Africana studies, said Dolezal was an effective teacher and researcher with a strong grounding in her field. He said he’d presented with her several times at local events, and that she’d been hired consistently, quarter after quarter, for at least three years. Like other scholars, Finnie said it was absolutely not a requirement to be black to teach Africana studies. Indeed, many prominent African-American studies scholars are white. And the decision to hire Dolezal was not based on her status as an activist or NAACP roles, Finnie added. But Finnie said she had always presented herself as black to colleagues and that is how they knew her. Asked if Dolezal has misrepresented herself, Finnie said what’s known about her thus far is just “the tip of the iceberg on her personal story,” and that he preferred to “let the dust settle” before rushing to judgment about why she did what she did or her fitness for teaching going forward. Academic integrity is important and will be protected, he said, but it’s too early to make any definitive statement. For now, Dolezal is still scheduled to teach in the fall. Little has surfaced so far about the conditions in Dolezal's classroom, beyond a BuzzFeed report  about a former student who complained Dolezal once doubted whether she looked sufficiently Hispanic to participate in a class activity about experiences with discrimination. Henry Giroux, the McMaster University Chair for Scholarship in the Public Interest at McMaster University in Ontario, Canada, who has written extensively about race and education, said Dolezal might be able to move forward with her students by telling the truth and apologizing. Her biggest offense? Having used race to “authenticate her ability to teach the subject” or somehow raise her academic status, if in fact she did, Giroux said -- since that would play into all kinds of falsehoods about identity and scholarship and politics. One needn’t live out an experience to teach it, he said. Like Giroux and seemingly half the world, Bow, at Madison, also wondered what motivated Dolezal to pass as black. Asked if she was misrepresenting herself to the public, Dolezal said, "It's more important for me to clarify that with the black community and executive board [of the NAACP] than to explain it to a community that I don't really think understands race and ethnicity." Asked if she was African-American, Dolezal said she preferred the term black and considered herself to be black. Bow also noted that Dolezal’s done a lot of anti-racist work in her life -- something she said can’t be discounted. And DNA sequencing is revealing that race is evermore “fictive,” in that biology does not simply confer race on anyone, she said. Nevertheless, Dolezal’s misrepresentation, especially to her students, remains problematic, Bow said. Bady, at Texas, said he thought that deception is one reason Dolezal’s case has captured so much attention. Junior, at Temple, attributed the viral nature of the case to the trove of photos and videos Dolezal’s shared of herself on social media. Of course, she said, all that must be considered along with the fact that Dolezal lied for years, including to her students. Giroux said he got the sense that Dolezal was somehow “carried away” by subject matter that’s close to her heart. But the frenzy over her story is more about our culture than Dolezal herself, even though it doesn’t seem that way, he said. Giroux also said he thought Dolezal’s case came at a time, post-Ferguson, in which the “lie” that racism doesn’t exist has been cracked wide open. Finnie, Dolezal’s program chair, also said he thought interest in the story reflected heightened tensions about race going back to 2008, when President Obama was elected. But perhaps the biggest reason this has captured the attention of academics in particular is that race is in so many ways an academic issue.